These easy-to-make pork sliders are sweet from the pineapple rings and tangy from the BBQ sauce—and they can be ready to eat in less than half an hour! Cook onions in boiling water 5 min. or until tender; drain. Place in medium bowl. Add vinegar and sugar; mix well. Refrigerate until ready to use. Shape meat into 8 (1/2-inch-thick) patties. Cook in large skillet sprayed with cooking spray on medium heat 4 to 5 min. on each side or until done (160ºF). Top with cheese. Spread cut sides of rolls with barbecue sauce; fill with burgers, onions and pineapple. Serve with fruit and assorted cut-up fresh vegetables. 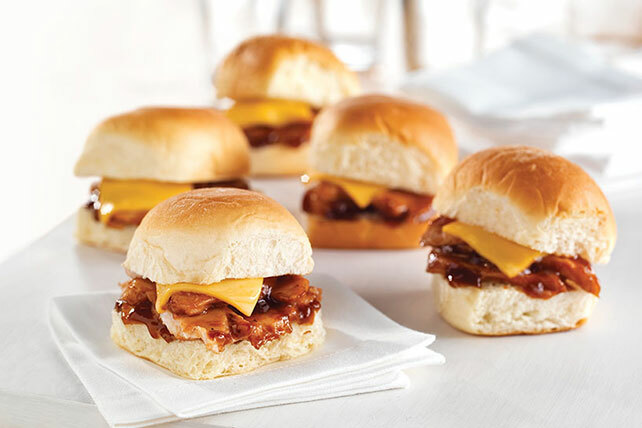 These tasty sliders are the perfect size for kids' little hands. And the sweet combination of barbecue sauce and pineapple is sure to be a hit with both young and old alike.